. Published on March 25, 2019. In the universe of virtual telephone systems, Grasshopper is a supergiant. Every company in the market feels its gravitational pull, even though they are subtle and conservative in their operations. That doesn’t mean they should be the first place a customer looks though. We’ve already explained how MightyCall is the best alternative to GrassHopper, but we don’t just want you to take our word for it. There are dozens of companies to choose between, and when you buy a virtual phone system, you should be confident in your decision—in why you’re choosing that particular company. To help you sort out the differences between all the options out there, we’ve compiled this master list, so to speak, going through the pros and cons of the main options you have past GrassHopper. At the end, it’ll be clear how well each VoIP provider compares to GrassHopper, MightyCall, and each other. We’ve compiled this list (with sneak peek screenshots of each service included) because nothing like it existed, and we want potential industry customers to have more reliable information than shady tech reviews, INC.com articles from 2013, and aggrieved customer comments. None of that changes the fact that we are proud of our service and think it’s the best one on the market, but it also doesn’t mean it’s perfect or our competitors don’t have good products too. It’s ironic that GrassHopper is as big as it is, considering it does not technically use VoIP technology. The company instead specializes in call forwarding and management through PSTN (Public Switched Telephone Network) ― conventional landlines which offer exceptional reliability and don’t depend on internet connectivity. This provides their call quality with dependable consistency, but also limits the overall system’s scope. GrassHopper is routinely knocked for lacking advanced features compared to their competitors, even in praise-filled reviews. GrassHopper is not bad bang for your buck in this market, and with transparent pricing plans and no long-term contracts, you’re not trapped if you dislike the service. By their pricing plan’s own descriptions though, it’s a bit concerning to see their $80 plan billed at “a growing business with 1-3 employees.” If you’re paying $80 a month, the system should be powerful enough to accommodate more than 3 people. MightyCall is nearly twice as cheap! MightyCall manages all client requests – not just calls, but also emails, website clicks, and Facebook & Twitter. True to its name, Line2 is mostly about providing people with a 2nd phone number for personal or business use. Their plans reflect that, so if you’re planning to use it for business you’ll pay $14.95 monthly. They offer a free 7-day trial and a 30-day money-back guarantee, but the presence of a long-term contract is a bit off-putting when most VoIP providers have abandoned them. If you’re a solo entrepreneur, Line2 is a great choice, but if you have a business with multiple employees, you run into some trouble immediately. Line2 only offers 1 phone number and 1 extension, and you can only be signed into 1 device at a time, so using it with multiple people would prove difficult. Additional lines cost $14.95 a piece, so if your company is 3+ people the price will add up quickly. Line2 has a reputation for sterling call quality, and they’ve recently made advancements so their users can answer a call to their business number just like an ordinary iPhone call. However, their service lacks critical advanced features like call recording, call queues, hold music, and voicemail transcription. Without these features a business with a large call flow will see inefficiencies. You even need to pay an extra $14.95 for conference calling! Line2 is best at helping to manage your individual business affairs — not your business team’s affairs. The system clearly suits freelancers and individuals better than small business owners, no matter what name they stick on the plan. But if your business is 2 or more people, the functionality and flexibility of MightyCall’s system will help you so much more than Line2. If you’ve been doing any browsing on virtual phone systems, you’ve noticed Ring Central is likely the most prominent phone system out there. They’ve gotten the nod from Google, Microsoft, and Oracle, and they let that fact be known, which I can’t blame them for. However, bigger doesn’t always mean better, and that’s clear when looking at Ring Central. They’ve even recently overhauled their pricing plans, raising prices and making a lot of customers angry in the process. 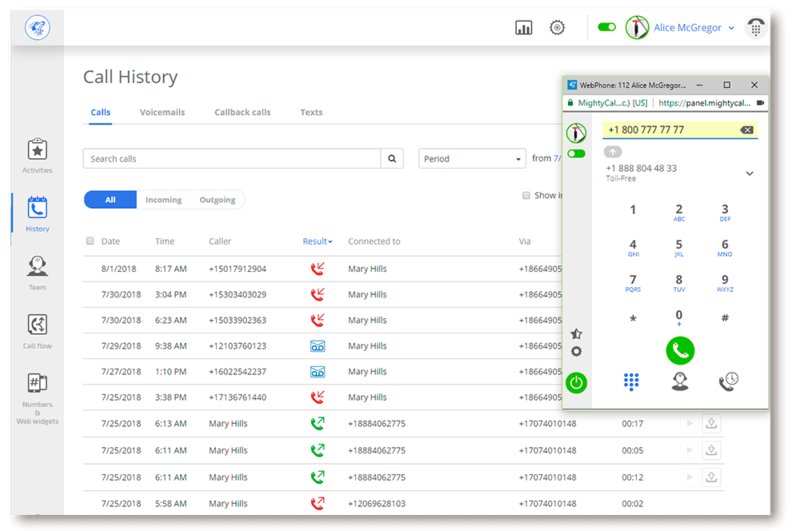 Ring Central is a more hands-on kind of VoIP provider as well, necessitating the use of special desk phones (that you have to rent or buy from them) to maximize the service. This is a stark contrast within the VoIP market, separating the Grasshoppers & MightyCalls from the Ring Centrals and Vonages. While having special equipment normally is a good bet to increase call quality and reliability, trying to make calls without the equipment is a surefire way to get a subpar connection. For as solid as Ring Central can be, it’s inexcusable to group pricing plans from 2-99 employees together. Ring Central used to be known for its flexibility, but these new pricing plans reduce that. The needs of companies with such differing sizes don’t overlap much, likely leaving both ends of the spectrum wanting more or paying more—especially when their plans only offer 100 minutes at $19.99 a month, 1,000 minutes at $24.99 a month, 2,500 minutes at $34.99 a month, and 10,000 minutes at $49.99 a month (and those prices are on annual contracts–month-to-month prices are higher). That might work for big companies like Google and Dropbox, but for yours? That’s less certain. Vonage owns all of their technology, which crazily enough, is not true with most other VoIP providers. This means they can fix any problems you might experience quickly, without consulting an outside party—whether this translates to good customer service in practice is another question, but in theory, they have a huge advantage over their competitors. However, precisely because of the fantastic call quality Vonage provides, they are one of the priciest options on the market. Worse, their prices are rather opaque—you need to get a specific quote for your business, and it’s not guaranteed to stay at that number over time, even without the presence of long-term contracts. When you add up the cost of paying for each individual line, plus paying for more advanced features like call recording, voicemail transcription, and call queues, things get expensive quickly—it’s normal to pay up to and exceeding $100 a month for only 3 or 4 users (and that’s before buying advanced features). At many other providers, that much would get you significantly more features and access with call quality that isn’t dramatically worse. No matter how well Vonage executes the basics of a phone system, many small business owners will be better served looking elsewhere unless call quality is literally their only concern when shopping for a virtual phone provider. Jive has been emerging in popularity lately, but that’s largely a result of their massive advertising campaigns. That’s not to say they aren’t doing anything right when it comes to their virtual phone system, but despite the system being solid, it is not head and shoulders above the other options on the market. Jive offers unlimited minutes and a ton of features, but their pricing plans are based on the number of users a business has, instead of straightforward packages that MightyCall or Grasshopper offer. Aside from some minor exemptions, with Jive you will run your business communication through 1 business number, and each user extension is between an additional $20-30 a month (the base fee is $19.95). Maybe that works for your business, but with only 3 extensions you’re already looking at around $100 a month. Without the long-term reputation of industry old-timers like Ring Central or the premier call quality Vonage offers, is paying that much justifiable for most businesses? Even if many competitors make you pay extra for features (while every feature is included in all of Jive’s quotes), Jive doesn’t offer anything extraordinary—and even lacks some more modern features like website widgets, social media integration, and transcribed voicemails—to make a commitment to them a no-brainer. Google Voice is not technically “involved” in the VoIP market since it’s a free service, but its presence does affect the rest of us. Being free is by far its biggest draw, and if someone goes online to find out about the VoIP market, they may jump at the chance to use Google Voice. However, know that Google Voice is not a true answer to business VoIP (it even tried to restrict commercial use of the service until recent years). If you simply want a second number to protect your personal phone number, Google Voice is great, but if you want a business number to manage your company’s communications, Google Voice will not be able to do much for you (especially since your calls are managed through your cell phone provider anyway). Google Voice has basic calling features, but lacks over half the features that nearly every other VoIP provider offers, such as: toll-free numbers, vanity numbers, business hours, call queues, music on hold, a softphone, etc. With no extensions available and only 1 number provided, any company with multiple people would suffer from the lack of integration Google Voice offers. Throw in the facts that some of the few features there don’t work on outbound calling and the complete lack of customer support, and it’s clear that you should only use Google Voice for personal use or to manage a super small, solo side business. Social media tracking: Facebook & Twitter. Phone. com is another of the “old guard” on the Voip market. They have long been a favorite of professional reviewers, and thanks to somehow managing to get their hands on one of the simplest and most intuitive domain names possible despite being founded in 2007 (Phone. com, really? It’s truly idiot-proof), the company has held quite a reputation for the better part of this decade. They offer quite flexible calling plans as well, with a different set for limited plans and unlimited plans. The limited plans are (monthly): $12.99 for 300 minutes, $19.99 for 500 minutes, and $39.99 for 1,000 minutes; the unlimited minutes plans are: $22.99 for 1 number with 5,000 texts, $24.99 for 2 numbers with 10,000 texts, and $27.99 for 3 numbers with 20,000 texts. While the limited monthly plans don’t offer the best bang for your buck value on the market, the unlimited plans are fantastic for under $30 a month. Most of the basic features needed in a phone system come included, and if you have a bigger business or call flow, you can even get a custom quote. The downsides to Phone. com are the higher cost of advanced features and the equipment that’s recommended. Phone. com, like Ring Central, offers their own choice of phones to help run your system. While using extra equipment can help call quality as mentioned before, getting started with the system isn’t as quick and easy as simply subscribing to a cloud service like MightyCall and Grasshopper (virtual phone systems centered in the cloud have varying abilities and capacities, but they all fully function without any additional equipment). Phones are $4.99 a month per device, as are phone numbers, while call recording is $4.95 per 300 minutes and access to call analytics is $3.99 a month. It’s also useful to note that Phone. com lacks some of the newer features on the market like social media and website integrations.